As the Global Marketing Director for the Jack Daniel’s Family of Brands, I was charged with leading global brand building for the brand, setting strategic, creative direction, developing cut-through creative, portfolio innovation and home-place marketing. Led the creation of globally relevant marketing campaigns that could be scaled for local activation. Developed a portfolio strategy that changed the competitive frame of reference and broke from the trap of age statements. Built the foundational value of the Jack Daniel's brand in emerging markets through brand storytelling. Inspired regional teams and local agencies with a unified design vision. After a couple of rounds of work Arnold Worldwide, our AOR, delivered a holistic campaign touching broadcast, print, digital, in-store and even product. 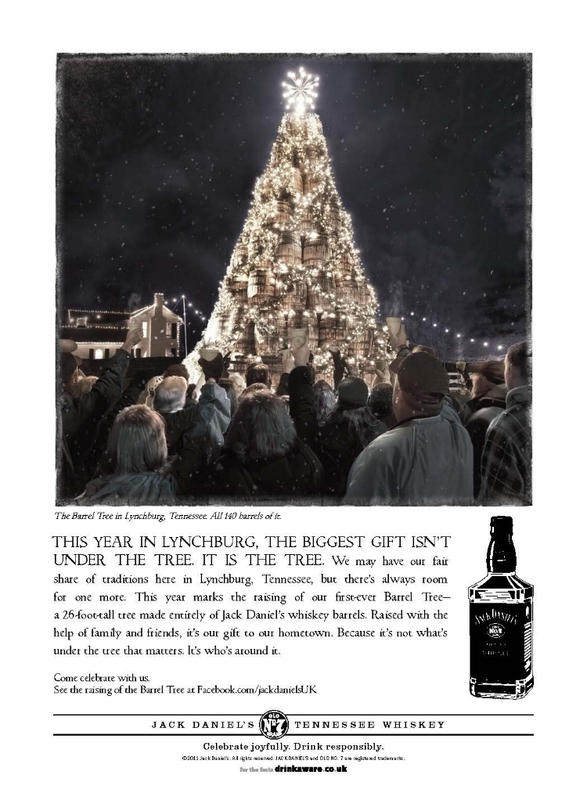 We bottled and sold the whiskey from the 186 barrels used to construct the Jack Daniel’s “Barrel Tree.” We also kicked-off a new tradition, the lighting of the barrel tree at the annual Christmas festival in Jack Daniel’s hometown of Lynchburg Tennessee. Age statements are a communication device that is easy for consumers to decode - 25 is larger than 15, so it must be more premium - but they are a trap for distillers; forcing them to produce whiskey and hold valuable inventory based on shaky long-term forecasts. Jack Daniel’s does not use age statements, relying instead on the master distiller’s craft to set it apart. A successful portfolio strategy must reconcile these opposing points, giving consumers an easily decodable system without using age. The first expression from the newly developed portfolio strategy was in partnership with the Frank Sinatra Estate. Jack Daniel’s Sinatra Select, launched globally in Global Travel Retail, was the most expensive expression of Jack Daniel’s ever sold, with a retail price of $150, approximately 5x more expensive than Jack Daniels' Old No.7. In addition to the learning that came from our first entry into the super-premium whiskey segment, the partnership reinforced an important part of the brand's history; Jack Daniel’s place in music and popular culture. A faster follower was Jack Daniel's No.27 Gold. Developed for the Chinese market this expression has rolled out progressively since. The numbering system pointed to process, double-barreled and double mellowed, not age. As Jack Daniel’s grew, the number of people creating consumer-facing content and programs grew with it. Along with the volume of new material came an increased pace requiring more things faster. The most reasonable way to manage the amount of work was to decentralize the approval progress. To facilitate the decentralization of decision making we needed to help local marketers make better decisions; working with a team of designers and creatives we produced the Jack Daniel’s Guiding Principles manual. These newly codified principles were a source of inspiration for finding compelling ways to tell the story, engage emotionally, express uniqueness and exude quality.